It’s good to be king, and Billy Janniro is now king with a historic national championship win. 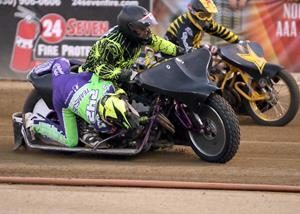 On Saturday night at Fast Fridays Motorcycle Speedway in Auburn Ca. 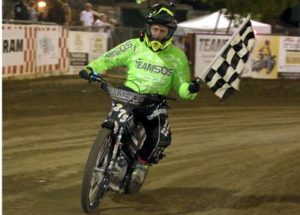 at the Gold Country Fairgrounds, Janniro won his ninth AMA National Speedway Championship, becoming the first American speedway rider to accomplish such a feat. 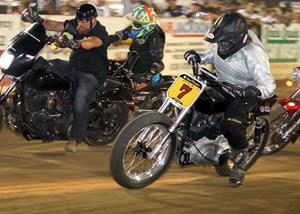 Until Saturday night Janniro was tied with international speedway champion Greg Hancock with each rider owning eight sanctioned national championships. 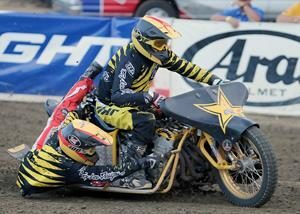 Hancock currently races professionally in Europe and did not compete in the five round AMA National Speedway Championship Series this year. Coming into the fifth round and Grand Final Saturday night, Janniro led the series with 78 points and it was really his to lose. 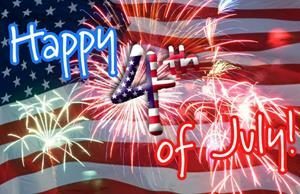 He was closely chased all season long in the championship series by rising speedway star Luke Becker who also currently is racing in Europe but made four of the championship rounds, gathering 67 points overall after four rounds and leading Janniro in points after round one. Racing commitments in Europe kept Becker from attending the fifth round Saturday night giving Janniro a little more breathing room. In third place coming into the Grand Final, Austin Novratil who brought 65 points into the final and could of played the spoiler with a great night combined with a bad night for Janniro. The format was twenty rounds for the sixteen riders who qualified for the final, each accumulating points for finishing position leading to the top eight riders after 20 rounds going into two semi-finals. The top two finishers from each semi then transferred to the Grand Final Main Event still accumulating series points and the first place finisher becoming the winner of the round. 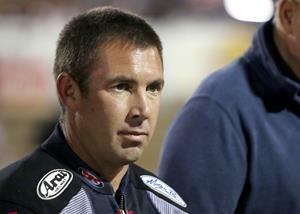 With each race riders added points to their round and series totals. In semi-final one, Dillon Ruml, Max Ruml, Charlie Venegas and Russell Green earned spots. Dillon Ruml finished first and Max Ruml finished second, both Ruml brothers moving on to the Grand Final. Semi-final two brought Janniro, Aaron Fox, Bryan Yarrow and Bart Bast to the start line. Janniro picked up that win and along with second place finisher Fox moved on the Grand Final also. Janniro, was not perfect in round five, the only series round he did not win. He began the evening immediately dropping a point with a second place finish to Max Ruml in heat one. In heat 20 he also dropped another point to Dillon Ruml and in the grand final race he again dropped a point and the final round win to Dillon Ruml with a second place finish. 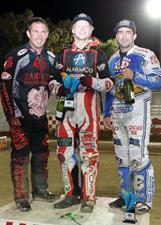 Janniro was second, Aaron Fox was third and Max Ruml was fourth in the Grand Final race. Janniro finished the Grand Final round with 18 points and the championship series with 96 points. 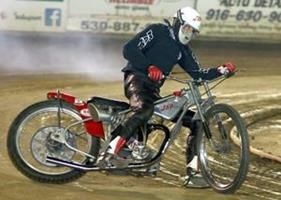 Janniro 38, began his speedway career racing as a junior rider in 1995. 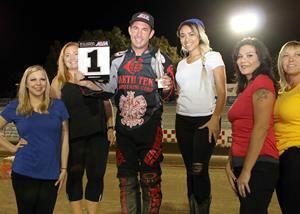 He won his first AMA National Speedway Championship in 2008 and followed with AMA National Speedway Championships in 2010, 2011 then winning six AMA Championships in a row beginning in 2013 up to and including this 2018 championship. During his 23 year career Janniro also spent a few seasons racing professionally in Europe. 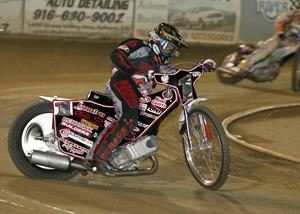 Janniro is the most accomplished speedway rider in America with a racing resume covering every noteworthy speedway racing championship in America. “It was a tough season but things worked out, everything was in place and ready to go,” said Janniro. “When I started racing I never thought this would happen to me, I was just a kid, having fun, got good here, went to Europe and got better and here we are,” he said. Austin Novratil finished the series with 72 points for second place, Luke Becker finished with 67 without racing in round five in third, Dillon Ruml finished the series fourth with 59 and Aaron Fox finished the series with 51 in fifth place. It was a fantastic night of racing, with all the riders giving it there all. Congratulations go out to Janniro and his crew for this historic championship win and to the staff at Fast Friday’s for putting on a professional, exciting Grand Final. Anthony Dion won the Youth 250cc main event and Colton Nelson won the Youth 150cc main event. 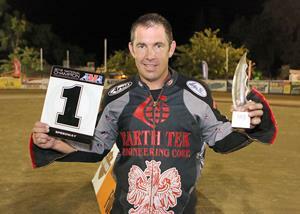 Billy Janniro holds his ninth AMA championship number one plate. 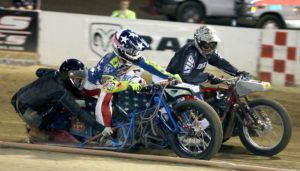 Janniro broke new ground in American speedway with his historic win, more championship wins than any other American speedway rider. Billy “The Kid” Janniro in action on his way to a championship win. Game face time for Billy Janniro during the rider’s introductions before the start of round five of the AMA National Speedway Championship series. Billy Janniro on the winner’s podium with the Fast Friday’s trophy girls.